Early in life, I tried to dig wells for a living, but nature conspired against my success. A farmer hired me to dig a well on a hill, where he thought gravity would allow him to run the water easily down to crops and cattle and to his cabin. I figured the easiest way to construct the well would be to pile a lot of potholes on top of each other. As it turned out, potholes are quite slippery. During my first attempts at stacking them the well tipped over several times. I finally anchored them with a good straight posthole through the middle, and wrapped them together with a ditch. The whole thing (or should I say "hole thing") filled with water, and for a short time the farmer was happy and I was very proud of that well. Unfortunately, a tornado came through and blew the hill away. It left the well about 100 feet in the air. Of course, all the water fell out and the farmer demanded his money back. I pointed out that he picked the location and I was not responsible for acts of God. Not long after that, I decided to look for another line of work. The well is still up there, but so is that angry farmer, so I don't point it out when I'm in that part of the country. copyright ©2009, 2011 Laurie J. Anderson, all rights reserved. I made a stop at Mule Camp this week, since enough time had passed since my last visit to warrant a renewed need by its residents for Wizard Water©. My clientele in this part of the country are mostly composed of hard-working cowboys ready for some form of entertainment. This describes my medicine show perfectly. They were amazed by the silver linking rings, amused by the jumping silks and awed by the properties of super-saturated Wizard Water©. These boys don’t get to town much, though, and I should have taken that into account when presenting one particular illusion. When I produced a colorful paper streamer from my mouth, some of the less sophisticated members of the crowd mistook it for a deadly, writhing air-snake. Many ran, paying no particular heed to the store windows that obstructed their retreat. Those who did not run began shooting at the streamer. I had to end to the show abruptly and make a hasty exit towards the hills. Since the streamer was attached to me, however, many earnest cowboys followed, guns blazing, in an effort to detach the beast from my person. I later learned from Jim Dunham that this was less due to concern over my welfare than a desire to be the first cowboy to possess an air-snakeskin belt. Luckily, I was able to safely divest myself of the streamer, and when the ruckus died down I returned to the wagon. Since I hadn’t reached the sale portion of the show and was badly in need of funds, I prepared to perform again. Several shopkeepers whose windows and merchandise had suffered from the fracas however, kindly took up a collection in my name. They presented me with a handsome sum and urged me to take the show to Tascosa, where they said they know of certain other merchants in desperate need of a medicine show. I should reach that town sometime tomorrow. 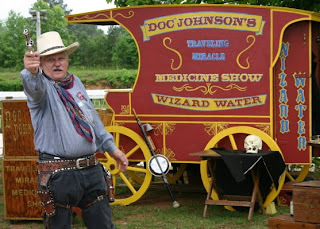 Doc will be at Mule Camp May 21 - 24 near Covington, GA, demonstrating the virtues of Wizard Water© to one and all. Mule Camp is sponsored by the Single-Action Shooting Society, an international organization of members who share an interest in the 19th century American West. You don't have to be a member to attend, however! Come by and enjoy demonstrations of expert marksmanship, fancy gun spinning, cowboy and cowgirl attire, and Western music! 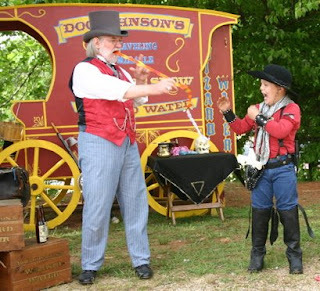 Pictured here: some cowboys being entertained by Doc, and Doc introducing cowgirl Devon Dawson to his wondrous Wizard Water©. Lately I have been thinking about self-defense. I do not like using firearms, as my sense of self-preservation tends to interfere with my aim. Many fellows, when called out in a dispute, will rashly face their opponent. I think it is wiser, if running is not an option, to shield oneself first and then use a pistol to convince your opponent that you are not worth the trouble. The direct method has the advantage of ending disputes quickly. My “safety first” method results in less personal injury, but tends to take longer because it is harder to aim convincingly while ducking behind a horse trough. Accordingly, I have developed a gun which can shoot around corners. 3. the ability to attach a very large magnet to your opponent without being noticed. I am still working on how to overcome the latter challenge. The efficient management of any mercantile business depends upon good bookkeeping. It is, however, a tedious, mechanical act which anyone with the proper training can do. Since my wife usually remains at home while I am on the road, I determined to train my assistant Bleb, who accompanies me on business trips, in the basics of math and record-keeping. This would enable me to make the most of my valuable time in other lucrative pursuits. At first I tried to teach Bleb using stones as counters, but he would not respond. After switching to corn, however, a light seemed to dawn and he quickly learned his tables. He seemed to like addition and multiplication the best, with somewhat less enthusiasm for subtraction and absolutely no tolerance for simple long division. This suited me fine as I’m not so fond of even splits myself. Bleb’s final hurdle was learning to tell coins apart. He had no problem determining the difference between copper pennies and five dollar gold pieces -- both are small coins but of different colors. Denominations between those gave him pause, however (two-cent and three-cent pennies sometimes confused him, as did dimes and silver half-dimes). He developed a two-part method to overcome any problem: first he would eye the coin, and if he knew the denomination he would push it off the table into a sack and record the amount with a hoof mark in the dirt. If he was uncertain, he would lick the questionable coin and thereby ascertain its true value. He was quite accurate, though my wife complained of having to wash our income before she could pay for groceries. Things were working out well until the day I decided to put all our profits in a new hiding place. Bandits had been holding up coaches and lone riders alike on a long stretch of road we had to traverse to get home, and I was afraid that the usual spot was too obvious. I was right in that respect. 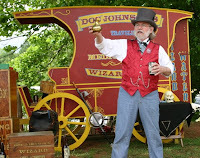 When several masked men stopped me outside of Dahlonega, the first thing they did was search the wagon bed for a hidden compartment – which they found right away. It was empty, however. I protested that I had lost all my money in a game of chance the night before, but the bandits refused to believe I had nothing (one of them insisted he had lost all his money to me at that same game). They tore the wagon apart, then ripped up my coat and pants, looking for hidden linings. They found nothing. Finally, after much cursing and smashing of Wizard Water© bottles, they left in disgust. I heaved a sigh of relief, and removed Bleb’s feedsack, which he had been quietly munching on through all the ruckus. At the bottom of the sack I had buried about a pound of five-dollar gold coins. Unfortunately, it was empty, too. Bleb had eaten all his feed, and being rather hungry that day, the gold as well. From this I discovered that it is possible to develop a taste for accounting, but there’s still no accounting for taste. Luckily, I was able to get Bleb home to the barn before that costly meal worked its way through his system. My wife will never forgive me, though, for the cleaning job she had to do on our income that week. Lots of folks who are vegetarians don’t realize that it is okay to eat meat. Meat is just processed vegetables. Cows have a diet of grass, grain, or corn, and then process them for you, which saves your body the strain of digesting a raw product. Likewise, when you drink beer, you are getting concentrated grain. Beer for breakfast is perfectly acceptable and a quick way to get your daily dose of grain if you are in a hurry. 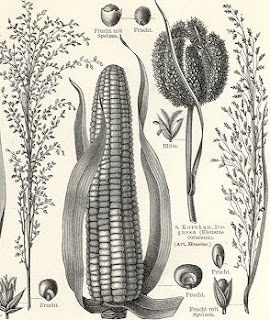 Whiskey is even better for you because it takes the essence of corn and distills it down to its basics in a super-concentrated form. Alcohol does kill brain cells like you’ve been told, but it only kills the weaker ones, leaving the stronger cells to flourish. So a bottle of whiskey not only nourishes and strengthens you, it makes you smarter as well. Donuts, cake and cookies are also all made from grain, and they contain sugar, which is known to give you energy. Some physicians advise against other stimulants such as chocolate and coffee, but bear in mind that chocolate and coffee are both made from beans. Beans, as anyone knows, are the chief component of our army’s diet, and if beans can keep a soldier strong, they can keep you strong, too. So my advice is that you have a breakfast consisting of the following: coffee, bacon, whiskey, sausages, beer, donuts and chocolate chip cookies. You will probably live longer, or at least in a considerably happier state.